From the 7th c. BC, Samos was a powerful naval force, which dominated the Mediterranean and was the major centre of the Ionians. The period of Polycrates was one of great economic and cultural prosperity on the island. One of the most impressive public works is the aqueduct designed by Eupalinos of Megara, which was a major technical achievement of the age. Samos was the home of artists such as the ring-engraver Theodoros, the philosopher Pythagoras, the poet Anakreon of Teos, and others. The great temple dedicated to the goddess Hera at Pythagoreion, is famous. Samos had a large, interesting numismatic output. Following the example of many Ionian cities, it struck coins of electrum, a natural alloy of gold and silver, from the 6th c. BC. A notable example of this coinage is the unstruck electrum stater (600-550 BC) found in the excavation of the German Archaeological School on the island in 1956. At the end of this century, it also issued silver tetradrachms with a representation of a lion's head and the prow of a Samian ship. This numismatic type was taken with them by the Samian refugees to the colony they founded at Zankle in Sicily after the failure of the Ionian revolt against the Persians (494 BC). 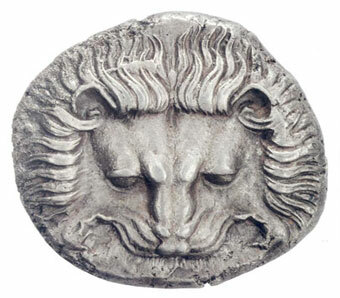 The preeminent Samian numismatic type is the lion's head and the front half of an ox. Where these two types symbolize a deity, this was undoubtedly Hera. The lion's head depicted on the coins recalls the lion-skin headdress which was the symbol of the divinity and the Great Goddess of Asia Minor. 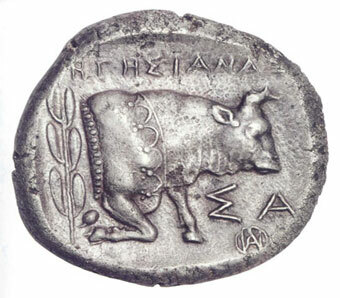 The depiction of the ox is also associated with the cult of Hera, to whom white cows were offered up as a sacrifice. In Ionia, Hera was known as boopis potnia Here, and Samos was the first Ionian city to issue coins at this very early date bearing her visual representation on the reverse. A similar case from about the same period is provided by the coins of the Athens, on which the owls symbolize Glaukopis Athena. After the Persian Wars Samos continued to strike coins with the same iconographic type, though it had evolved in accordance with the models of the period, down to 439 BC, when it was conquered and reduced to subjection by Perikles. The Samian mint began to function once more in the early 4th c. BC, producing silver and bronze coins.